Nixon Motor Sports: Weekend Plans! 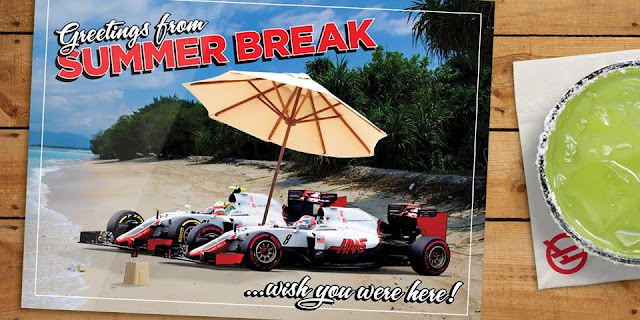 Haas F1 Team Summer Break! I'd love to be a Formula 1 driver right about now, because they get about a month off between races smack dab in the middle of the summer every year! I think it's related to the union labor laws in Europe and the tradition of everyone seems to take the month of August off for what's called a "holiday." OK, really, I'm not complaining, because mostly I'm not a full time professional driver, just a guy with a job that pays the bills for my driving hobby! Sunrise = Autocross Drivers in Rear View! Yeah, those pros have it tough, jet-setting around the world to race in Brazil, Japan, Australia, Monaco, Germany, Austria, etc. Those of us on the NMS team also get to travel around and compete behind the wheel, but the exotic locations sound more like Charleston SC, Charlotte NC, and Virginia Beach VA. Now that I write that out, it really doesn't sound so bad! I think I can say that since I've moved around a bit for my "job" and lived in places like Heath Ohio, Saint Robert Missouri, and Harker Heights Texas. So, back to this "holiday" thing and the upcoming weekend. Not complaining, but sometimes my job takes a bit of time, and of course I'm working on a degree that ends up being some homework just about every night, and then there's that Mustang that doesn't run sitting in my garage that I need to work on too. So, on top of that, I'm looking forward to the weekend. Mustang = Only Moving on a Trailer! Friday: work all day, then drive from Virginia to Charleston to get ready for Saturday. Splurge on a cheap hotel (because sleeping in air conditioning in a bed is a pretty good thing compared to not doing so). Saturday: Autocross all day, drive faster than NMS-South. Spend the rest of the day reminding Brian that I was faster. That will keep me busy. Or do homework that's due by midnight Sunday. Sunday: Instruct at the Tire Rack Street Survival school being sponsored by the South Carolina Region of the SCCA. Hopefully help out some young driver learn how to drive safer and have a lot of fun too. Pack up the car and drive all the way back to Virginia. Finish any homework before midnight that I ignored all week! 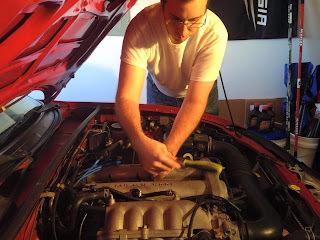 Brian Looking for Reasons the FIAT will Beat his Miata!